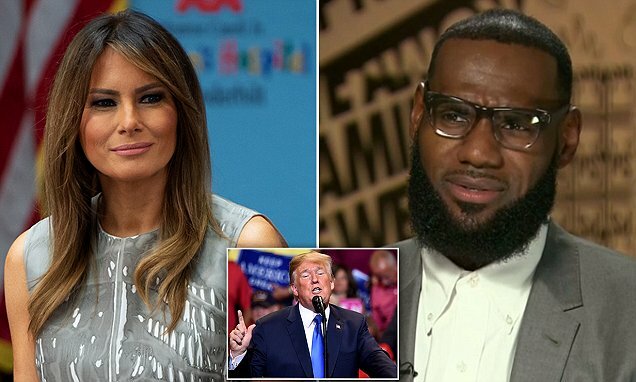 First Lady Melania Trump (left) has gone against her husband to publicly back NBA superstar LeBron James (right) and his new I Promise School - despite the President (inset) slamming James as unintelligent for his interview with CNN's Don Lemon on Monday. Trump slammed the LA Lakers star on Friday, saying the news anchor made LeBron look smart, which he claims is 'not an easy thing to do'. 'It looks like LeBron James is working to do good things on behalf of our next generation and just as she always has, the First Lady encourages everyone to have an open dialogue about issues facing children today,' first lady spokeswoman Stephanie Grisham told Associated Press on Saturday. FLOTUS was not alone in her support. Michael Jordan, - James' rival for the title of GOAT - who received a positive shout-out in Trump's tweet, also shared his support for James in a statement issued on Saturday. Melania's bold comments came just one day after senior aide Reagan Hedlund, who helped to develop the 'Be Best' anti-bullying initiative, was fired. FLOTUS isn't the only one to throw support behind James. 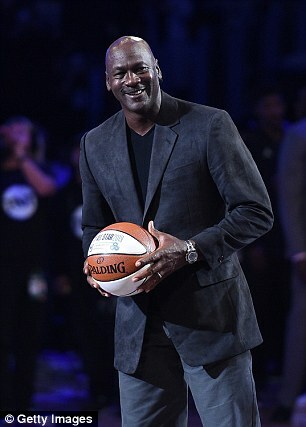 Michael Jordan put professional rivalry to the side on Saturday to support James. 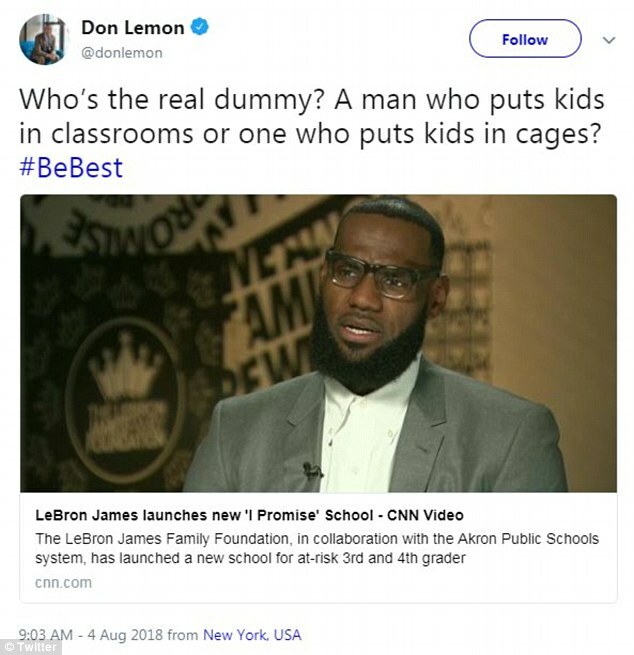 'Lebron James was just interviewed by the dumbest man on television, Don Lemon. He made Lebron look smart, which isn't easy to do. I like Mike!' Trump posted on Friday evening, appearing to reference Michael Jordan. The Commander-in-chief was referring to an interview in which the NBA legend opened up to Lemon about how he felt Trump had used sport to exacerbate US racial tensions. On Saturday, Jordan weighed in, telling NBC through a spokesman: 'I support LJ. He's doing an amazing job for his community'. Many tweeted both about separating children from their parents at the border, and of changes to how college students are treated and how their education is paid for. 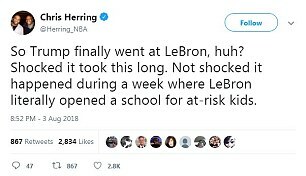 'This week, LeBron opened a school for hundreds of at-risk kids while Donald Trump's education secretary attempts to undo college loan forgiveness for students who were 'knowingly deceived' by their schools, and rolls back Obama-era guidelines on discrimination in schools,' Harrison Faigen, an NBA writer, posted. 'LeBron puts children through school. 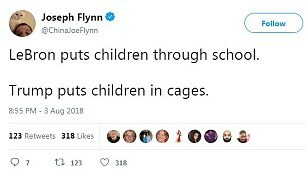 Trump puts children in cages,' his colleague Joseph Flynn wrote. 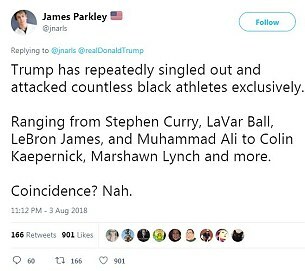 Others chose to point out Trump seemed to have little issue with white athletes, and had also publicly slammed Stephen Curry, LaVar Ball, Colin Kaepernick, and Marshawn Lynch. 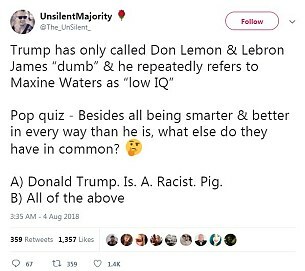 'Trump has only called Don Lemon & Lebron James 'dumb' and he repeatedly refers to Maxine Waters as 'low IQ',' one man wrote. 'Pop quiz - Besides all being smarter & better in every way than he is, what else do they have in common? Some also speculated Trump's attack came as LeBron had moved to California, which is not a swing state like Ohio, where he previously lived, unscathed by the President's wrath. In 2013, Trump said LeBron was 'a great player and a great guy'. Even POTUS' supporters found the tweet to be in bad taste. 'I support you but this is unacceptable, you need to apologize immediately,' wrote Wesley Cantrell. 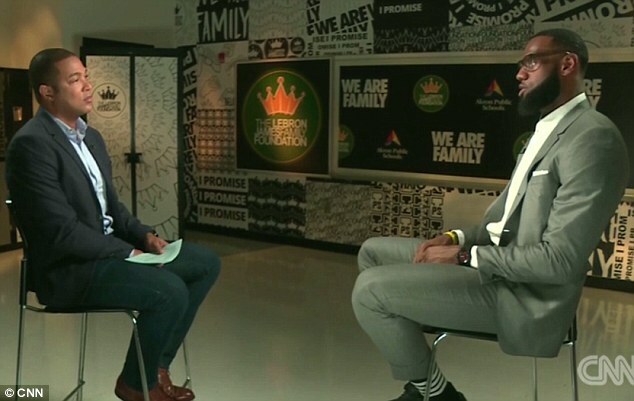 In his interview with Lemon, LeBron described how both athletics and education were high priorities for the young students at his new school, and lamented the idea of politics interfering with sports. 'When you're part of sports, it brings so much camaraderie and so much fun. We are in a position right now, in America more importantly, where this whole race thing has taken over,' he said. James said Trump is creating a wedge by using situations like NFL player Colin Kaepernick kneeling during the anthem and 'uninviting' NBA star Steph Curry to the White House. He also said he might consider running for office if someone said to him he was the only person and that Trump would win if he didn't step up. Trump appears to be on thin ice, not just with angry voters, but with his own family as well. 'I feel very strongly about that, and I am very vehemently against family separation and the separation of parents and children,' she said in an event at the Newseum in Washington.